What proportion of milk is water? You are right if you recalled that milk is about 87% water. Even calf starter grain is usually 10% moisture. Thus, our calves ingest water in the feedstuffs they drink or eat every day. But that water is not enough – calves also need free-choice water for digestive system development. Where does water go inside the calf? Everything the calf eats and drinks should go into the esophagus (not into her windpipe/trachea). However, not everything that enters the top of the esophagus ends up in the same place at the bottom end. Recall that in response to the taste, smell, and other behavioral patterns associated with the routines of milk feeding, the calf has a reflexive response. This muscular response in her rumen-reticular area forms what we call the “esophageal groove.” Thus, by means of this muscular structure on the side of the rumen, most of the milk is diverted from the rumen directly into the fourth stomach compartment we call the abomasum – the one that is much like that of pigs and humans. In contrast, plain water as well as dry feeds go directly into the rumen. There, the water and dry feeds mix and are subject to organic bacterial action (fermentation). For optimal fermentation, roughly 4 times as much water as dry feed is a practical guideline. Fermentation of carbohydrates (mostly from grains) in the rumen leads to papillae growth on the rumen wall. Where do these little fingers we call papillae fit into profitability? Ideally, we want to transition our calves from milk to solid feeds to reduce both feed and labor costs. However, the calf can only absorb nutrients from her rumen in proportion to the surface area of the rumen lining. That surface area depends heavily on the growth of these papillae – more and longer papillae means lots and lots more surface area. In a recent experiment in UK, grain intakes and growth rates were compared among calves with either ad-lib or no water through weaning. For both calves fed milk at either standard or accelerated rates, the consumption of calf starter grain was about 2.5 times greater with water compared to calves without free-choice water. Calves eating more grain gained grew more rapidly – it is that simple, more water equals more preweaning growth. Calves cannot drink water that is not in front of them! 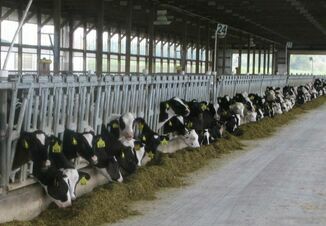 Make feeding water part of the daily routine for individually housed calves. In group housing, make the daily check of the waterers part of the routine. Calves cannot drink ice! In freezing situations offer body-temperature water while calves are still standing after their milk feeding. During freezing weather, I fed grain after milk/water feeding. At that time, I dumped water pails. 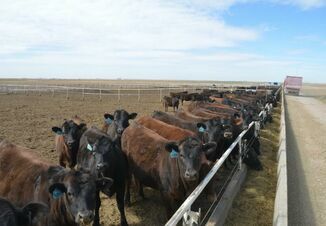 In group pens it is important to check daily that heaters are keeping ice out of the waterers. Calves prefer to drink clean water. In group pens frequent draining and cleaning of waterers encourages water intake. If water is offered in a separate pail at each pen, it is a best management practice to dump and replace water at least twice weekly – more often in hot weather. I set up a schedule to wash a few water buckets every day so that at the end of a week all my water buckets were cleaned. Water bucket placement can help, too. When possible, place water and grain buckets as far apart as practical in individual pens – you end up with less water in the grain buckets and less grain in the water buckets. Younger calves prefer to drink water closer to body temperature (103°F) compared to well-water temperature (e.g., 50°F). References: “Are you offering your calves ad lib water?” at www.volac.com/news/agriculture-news/news189/water-is-essential-for-all-forms-of-life (accessed May 10, 2018). Dracy, A.E. and A.J. Kurtenbach, “Temperature change within the rumen, crop area, and rectal area when liquid of various temperatures was fed to calves.” Journal of Dairy Science 51: 1787-1790. Ziegler, D. and Others, “Impact of free-choice or restricted water intake during pre-weaning and early post-weaning period on calf performance and heath,” Journal of Animal Science, 89: E-Suppl 1 p262. Quigley, J.D. and Others, “Prediction of water intake in young dairy calves.” Journal of Dairy Science 84: Suppl. Wiedmaier, R.D. and Others, “Frequent rinsing and cleaning of drinking water vessels improved the performance of hutch-raised Holstein calves.” Journal of Animal Science, 82: Suppl2, pp 116-7. Quigley. J.D. CalfNotes publications #’s 4, 27, 68, 77, 132 and 158.